I’ve written about beer in Spain before, but not from Granada in southern Spain, home to flamenco and the Alhambra – a palace and fortress containing some of the world’s most ornate decoration. It would be rude not to visit our local craft beer bar Colagallo (literally: rooster’s tail). It has a long bar with about a dozen taps, plus several fridges full of bottles. There’s free tapas with every drink, so you can mop up all the alcohol. The two barmen are very friendly and knowledgeable, helping you narrow down the fabulous array of beers and actually make a decision as to what to drink. 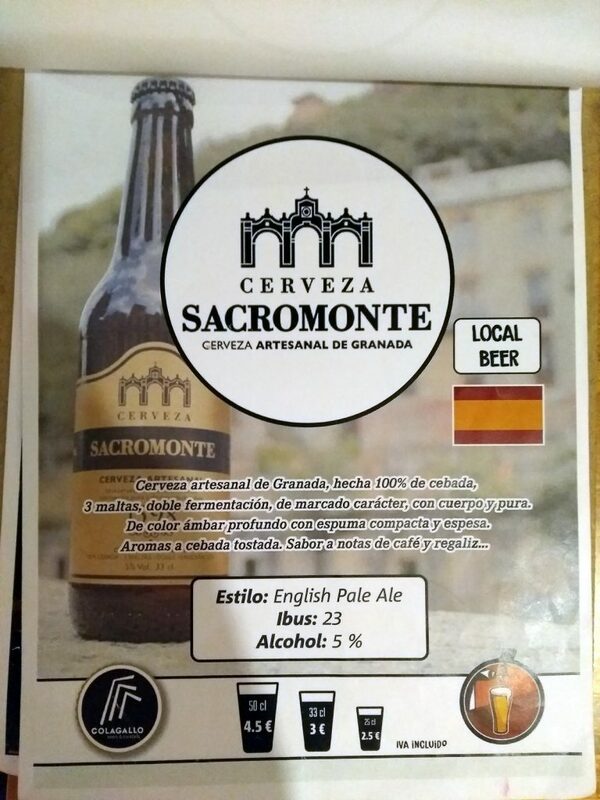 Sacromonte is named after the Gypsy neighbourhood of Granada and is, surprisingly, an English pale ale. Something undefinable hints that it hasn’t actually been brewed in England, but it’s still a very nice pint. El Niño Triste (The Sad Child) is a very creditable IPA in the American style, with plenty of citrus and tropical fruit flavours. Dalmoru is a light wheat beer with ‘subtle strokes of spices’. Who could resist that? There’s a good showing of beers from other countries too. We try Ayinger Braüweisse, a classic German wheat beer; Stand Tall, a US/Swedish collaboration on a sour Berliner Weisse; and Scarlet Hibiscus, an interesting concoction that contains hibiscus, orange peel and nutmeg. We finish our first evening with Petrolaco, an imperial stout with a whopping espresso-like punch. The description says ‘nothing roasted’, but I have to disagree, and it’s all the better for it. The level of alcohol makes it syrupy and warming. Is it a coincidence that its name contains the word ‘petrol’? On our second and final visit, I spot a distinctive bottle in one of the fridges. ‘Is that … ?’ I ask. Yes, it’s Westvleteren Abt 12, frequently lauded as the world’s best beer, a 10.2% marvel of Belgian brewing that’s as rare as dodo eggs. We’re due for a long day at the Alhambra in the morning, so I really shouldn’t. But Helen says, ‘It’s only some old buildings,’ and … that’s that. Figs, raisins, dates, chocolate, toffee, roasted malt, herbs, and yet somehow, despite the strength, it’s also soft and approachable and luscious. The world’s best beer? I don’t know, but it’s undeniably great and I sip it with reverence. For now, the tourist thing can wait.